Toys! What child doesn’t love toys? This high-energy, interactive French children’s song “DES JOUETS” teaches kids French words for toys and play activities. Kids can practice gross motor skills by acting out the verses of this French children’s song that teaches the French words for toys. This song is from Whistlefritz’s CD ALLONS DANSER! This video clip appears in Whistlefritz’s language immersion video L’ANNIVERSAIRE DE FRITZI. Song “DES JOUETS” from the Whistlefritz CD ALLONS DANSER! moi, je sais en jouer. Where is my Snuggly? This light-hearted song takes kids on a tour of house encountering different members of the family as they search for the missing Snuggly. “OÙ EST MON DOUDOU” teaches French vocabulary for rooms of the house and family members. The song is from the Whistlefritz CD CARNAVAL. 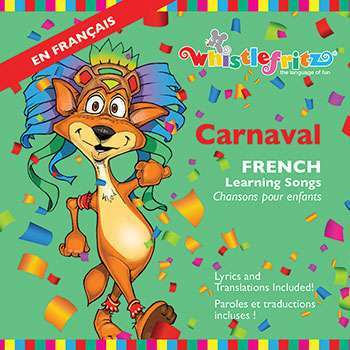 Song “OÙ EST MON DOUDOU ?” from the Whistlefritz CD CARNAVAL. As-tu vu mon doudou, Papa ? As-tu vu mon Doudou, Maman ? As-tu vu mon Doudou Robert ? Alors je vais le chercher dans le garage . . . Ben oui ! J’ai trouvé mon Doudou ! Mais je l’ai retrouvé !